The lead article is on the Moscow show trials. The cartoon caption: “Far be it from the Jews to enslave a single people. There is no problem or argument in seeing these cartoons for what they are. 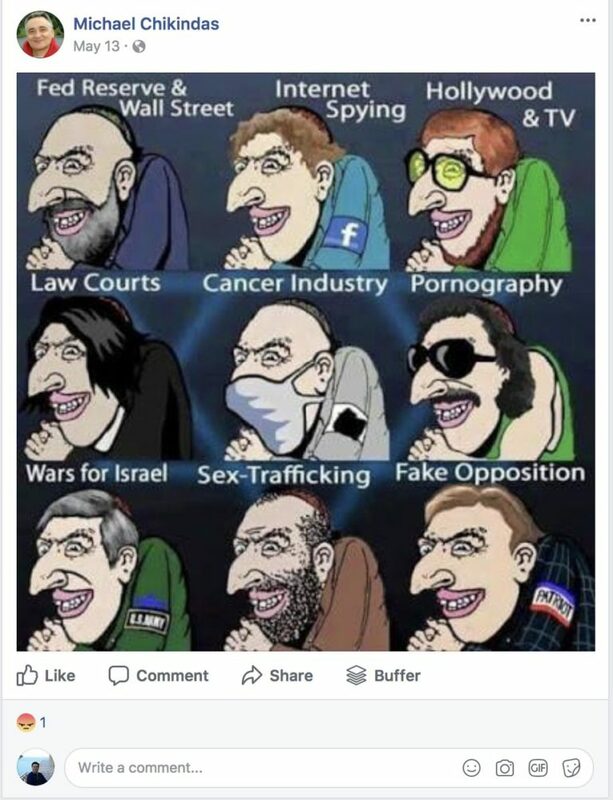 They portray Jews as ugly, threatening and outright dangerous. Since the late 1920s, Streicher's vulgar and inconsiderate style was increasingly a cause of embarrassment for the Nazi party. 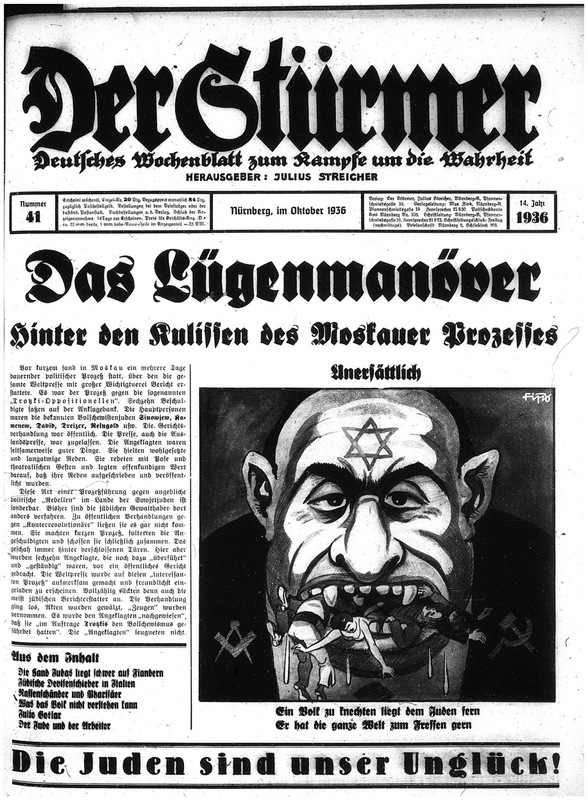 In 1936 the sale of the Der Stürmer in Berlin was restricted during the Olympic Games. 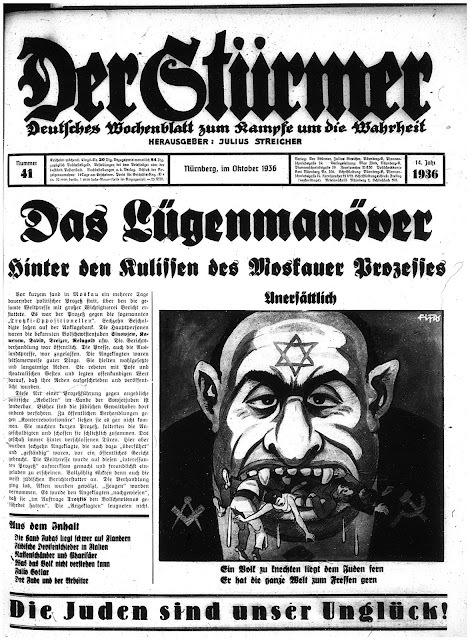 Joseph Goebbels tried to ban the newspaper in 1938. Hermann Göring forbade Der Stürmer in all of his departments, and Baldur von Schirach banned it as a means of education in the Hitler Youth hostels and other education facilities by a "Reichsbefehl" ("Reich command"). Though Hitler supported him, Streicher's luck finally ran out after the war when he was tried at Nuremberg. According to the prosecutors, Streicher's paper incited Germans to kill the Jews, thus making him an accessory to murder. 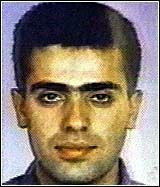 He was found guilty of crimes against humanity and hanged. If the Nazis themselves realized that Streicher was going too far, can we assume that today's antisemites are equally aware of lines that cannot be crossed? Over three weeks later and Rutgers is still trying to figure what to do about this. Let's face it: we will always have people who get deranged over Der Sturmer. 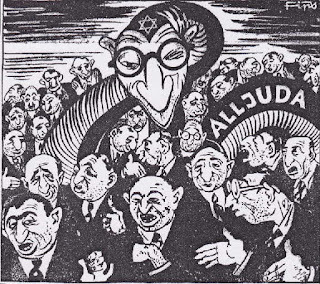 Those older cartoons demonized Jews, and did it in a way that was so obvious and so over-the-top that a time came that the Nazis themselves had a sense they had gone to far. 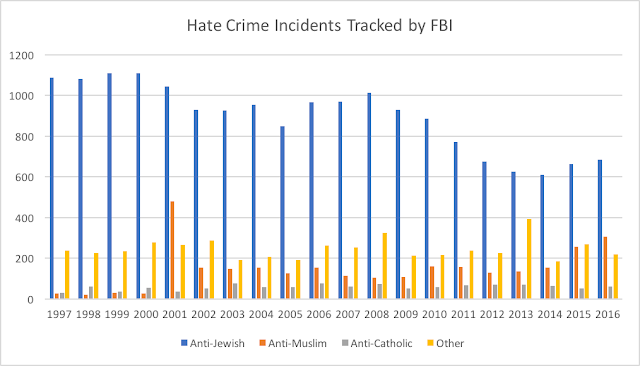 Are people more sensitive to antisemitism and anti-Israel propaganda today? How about the cartoon below from a Berkeley editorial. I gave it to my daughter as a current example of an anti-Israel/antisemitic cartoon. 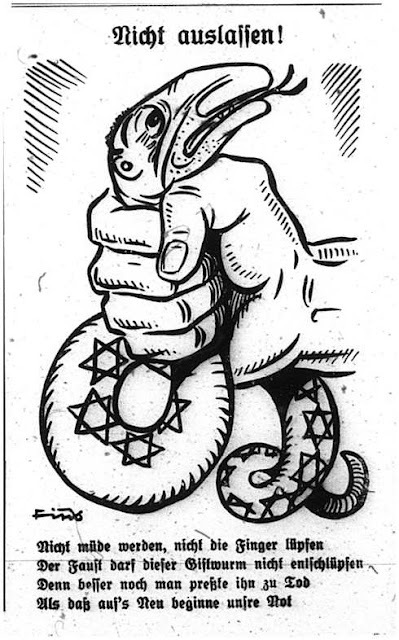 Raphael Magarik at the Forward justified the cartoon and claimed it wasn't antisemitic at all, but to do so he had to resort to proving his point by avoiding it. He picked up on the accusation that this was a "blood libel" -- and defended the cartoon because the whole issue was that blood is being spilled. He then goes on to defend the cartoon by claiming that the various implied attacks in the cartoon on Dershowitz and his politics are justified, which is actually besides the point. Overlooked was the fact that the image was not of Alan Dershowitz, but of Dershowitz with the body of a spider, an image used in Nazi cartoons, with all that image implies. I pointed out to my daughter the demonization in the cartoon and I think she understood the point. 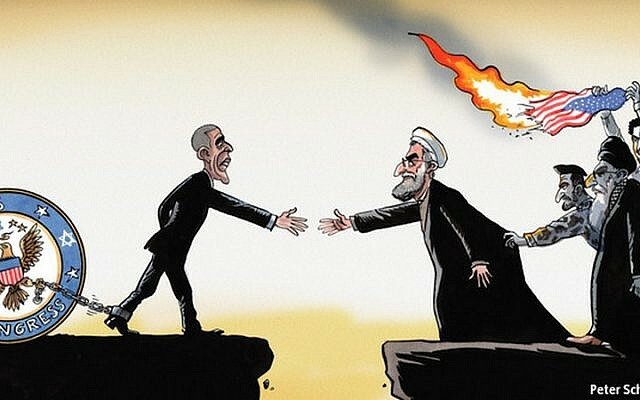 In the cartoon, the US and Iran, symbolized by Obama and Khamenei are being prevented from completing the Iran deal. Iranian hardliners are holding Khamenei back. Congress is holding Obama back. But one of those stars on that emblem of Congress is a Jewish star. The issue is not the implication that Jews in the US were trying to prevent the Iran deal. As citizens they had the right to oppose it. The implication was that Jews (or Israel) controlled Congress. 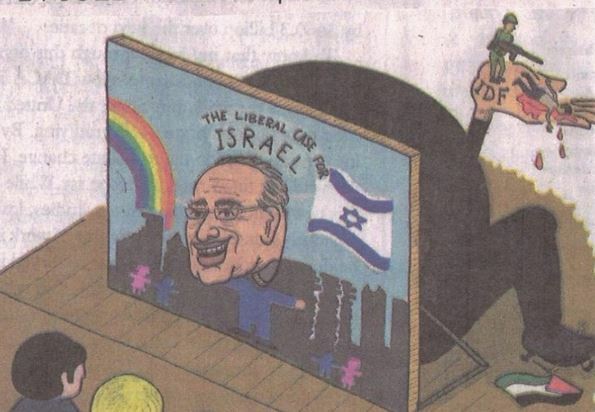 It may be more subtle than the Dershowitz cartoon, but that implication was an element of demonization of Jews -- and it was a point that was brought home when even the New York Times attempted to make opposition to the Iran deal into a "Jewish" issue. Israel should give free citizenship to US politicians. They are more loyal to Israel than they are to the American people. In another cartoon, at the beginning of the year, The New York State Education Department apologized for including a political cartoon on its global studies Regents exam that critics claimed was anti-Israel propaganda. 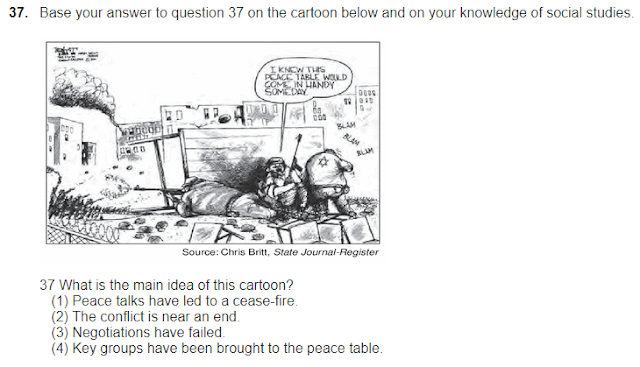 Considering the correct answer is (3) Negotiations have failed, the cartoon -- which criticizes Israel and only Israel -- is a poor illustration of the point. Using Natan Sharansky's 3 D's for determining antisemitism -- demonization, double standard and delegitimization -- none of those 3 factors seem to exist in the cartoon in a blatant hyperbolic way. Granted the cartoon is "blatantly anti-Israel" and "disparaging of Israeli soldiers," does that make it "inappropriate"? The exam was in New York. What would have happened if this appeared on a test in Iowa? 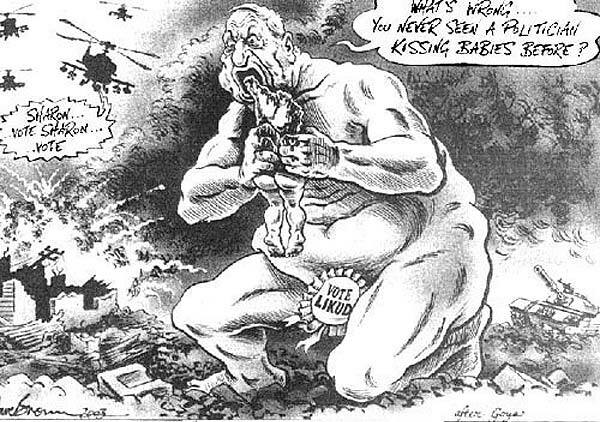 But this Ariel Sharon cartoon was "cleared" of being antisemitic by a UK press watchdog. More than that, the cartoon went on to win the UK's "Political Cartoon of the Year Award for 2003" of the Political Cartoon Society. But what about the resemblance to the Nazi cartoon above of a Jew eating people? Someone decided the cartoon was criticism, not demonization. Does over-the-top criticism automatically become demonization, antisemitism and anti-Israel propaganda? 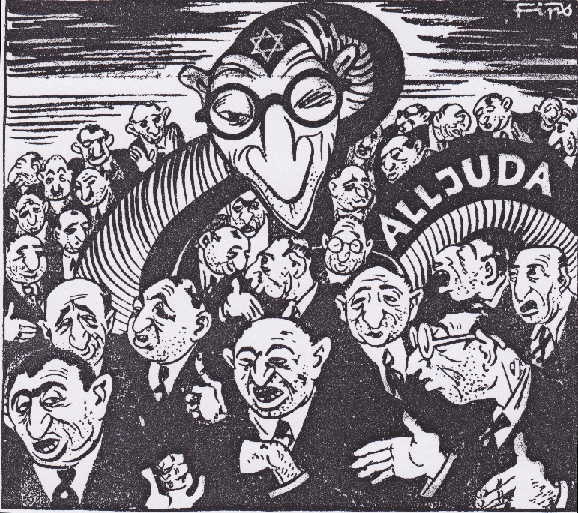 Fourteen years later, how do we distinguish antisemitic cartoons from criticism -- valid or not -- of Jews or Israel, especially when those cartoons can sometimes be more nuanced? Telling Jews that we can or cannot define what is offensive to us, because of our status as privileged minority in the United States, is antisemitic. Considering that this strategy is being used by other groups on campuses across the US, Jewish students should be able to use it too -- especially when the antisemitism on campus is such a threat. But do we really want to have to resort to the "safe spaces" argument? If we demand the right to define what is offensive to us as Jews, as opposed to seeing it as mere criticism, are we validating the claim that Jews deliberately define criticism of Israel as antisemitism? Safe spaces are not the answer. The line between criticism and demonization of Israel may not always be so clear. We have little choice but to stand our ground.